Performances from The Nutcracker, a hand bell choir, and old-fashioned Christmas carolers will entertain guests at this year’s Galveston Holiday Lighting Celebration at Hotel Galvez & Spa®, A Wyndham Grand® Hotel, on Friday, Nov. 28. One of over 1,000 holiday events being held this year in Galveston, “The Winter Wonder Island” of Texas, the Holiday Lighting Celebration is an annual, free family event and marks the start of the official holiday season on the island. The Celebration commences at 6 p.m. with the arrival of Santa Claus via horse-drawn carriage, which signals the lighting of the hotel’s iconic 35-foot Christmas tree located on the front lawn, overlooking the Gulf of Mexico. Children are invited to have souvenir photos taken with Santa and will receive a small gift. Adding to the festivities, Dickens on The Strand’s Queen Victoria and the Nesquik Bunny from Nestle Toll House Café will make special appearances, and Galveston Ballet and other local talent will set the spirit for this holiday season. To honor the true spirit of the evening, Hotel Galvez & Spa will collect monetary donations for the Salvation Army to help make the holidays brighter for all members of the community. In conjunction with the event, Hotel Galvez & Spa is offering a Thanksgiving “Turkey Day” Getaway package. The Thanksgiving Getaway package, available Nov. 26 and Nov. 27, 2014, includes a guest room for two, Thanksgiving brunch for two, and valet parking. Rates begin at $289 per night based on double occupancy. And, throughout the holiday season, Hotel Galvez is extending a Galveston Holiday Getaway Package Nov. 16 through Dec. 30, 2014. This package includes a guest room for two, breakfast for two and valet parking with rates from $179 per night. The hotel’s shuttle is also available to transport guests to Galveston’s downtown for shopping and holiday festivities, upon request. These packages will be available to book online in mid-September. To book these packages, see special offers at www.WyndhamHotelGalvez.com. Nov. 15 - Jan. 4 (open daily), Holiday “Ice Land” Exhibit and Festival of Lights at Moody Gardens: The new “Ice Land” exhibit will feature 20 large ice sculptures in a 25,000 sq. ft. structure while Moody Gardens Festival of Lights features a mile-long trail of holiday lights, ice skating and snow tubing on the Arctic Ice Slide. Nov. 28, Galveston Holiday Lighting Celebration at Hotel Galvez: Santa Claus will signal the lighting of the hotel’s 35-foot Christmas tree followed by holiday performances by the Galveston Ballet and other local talent. Nov. 29 – Dec. 20 (open weekends), Santa at Schlitterbahn Galveston Island Waterpark: Santa Claus will surf twice daily at Schlitterbahn and visit with children. Nov. 29, Dec. 13 & 20, Santa on The Strand: Santa Claus will make a special appearance at Saengerfest Park to visit with children and take photos. Nov. 29 – Dec. 31, Holiday Lights and Magic in the Park: Galveston’s historic downtown will sparkle with fun as Saengerfest Park is transformed into a holiday spectacle on weekends. Visitors to downtown will be able to enjoy holiday light shows, music, flurries of “snow,” visits with Santa and more. Dec. 5 – 7, Dickens on The Strand: Imagine the Victorian London of Charles Dickens transported into Galveston’s historic Strand District. This Victorian-themed holiday festival offers family entertainment, holiday food and drink, crafts, holiday décor and other gift items. Dec. 21, Santa Hustle Half Marathon and 5K: An estimated 4,000 “Santas” will race in the Santa Hustle Half Marathon and 5K donning their Santa beards and shirts. A complete calendar of Galveston holiday events is available at www.Galveston.com/HolidayMagic. 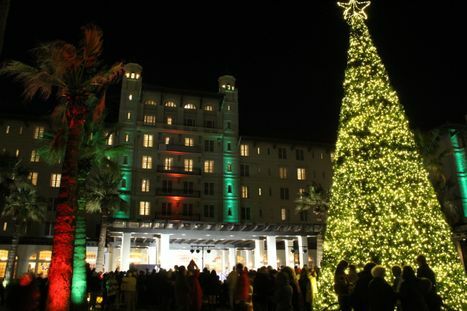 Hotel Galvez & Spa is host to Galveston's annual Holiday Lighting Celebration on the Friday after Thanksgiving. Visitors count down with Santa as the hotel lights its 35-foot Christmas Tree which is followed by holiday entertainment.